Fairtrade is an accreditation labelling system which certifies that products bearing the Fairtrade Mark meet a range of specific criteria based on international standards developed on a product-by-product basis. It covers a wide range of food items and also cotton and gold. Standards for other products will follow. The Key Principles and Goals of Fairtrade have inspired a grassroots movement to promote Fairtrade products in places of worship, schools, the workplace, boroughs, towns and cities. We can each encourage others to change our buying habits as we go about our daily lives. Fairtrade always relates to certified products with the colourful Mark. Fair Trade expresses a wider vision of development, seeking to transform the lives of poor producers and covering a bigger range of products than can be certified, such as craft items and rubber gloves. Concern for poverty alleviation is not just about writing a cheque. It's also about helping people to a better life by supporting what they are doing themselves. 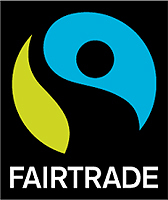 Every trade exchange should benefit the producer, but buying products with the Fairtrade Mark guarantees a real benefit. 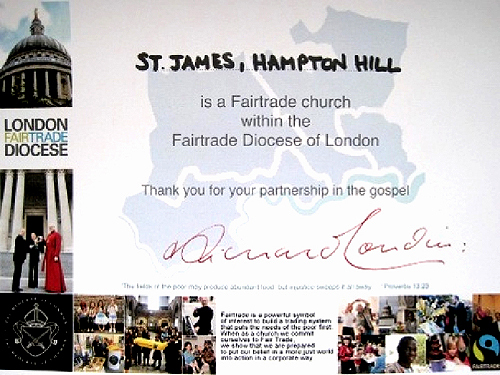 St James was awarded its Fairtrade Church certificate in 2006, easily meeting the three simple commitments of the Fairtrade Foundation. 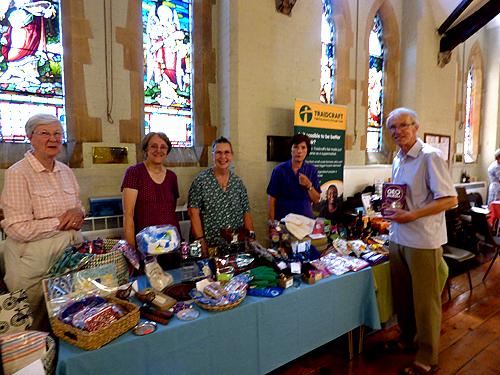 In 2007 we took our commitment one step further by starting to run a Traidcraft stall (running independently of parish accounts) on the first Sunday of every month and other suitable occasions. Traidcraft was one of the first companies to bring fair trade products to the UK consumer. It works with some of the most marginalised producers, helping them to build sustainable businesses that give people dignity and a future. As for many other companies, current trading conditions are not easy, and Traidcraft is working very hard to find additional markets for its products. 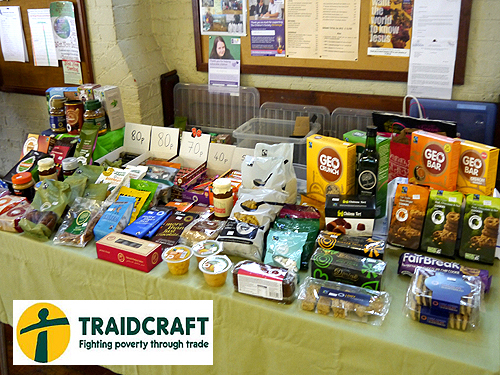 Our purchases from Traidcraft during 2017 were £6300. This includes all the food, crafts, cards and seasonal goods such as Advent Calendars and Easter Eggs. When you choose Traidcraft's Clean & Fair products, you’re investing in the future of fair trade palm and coconut oil – a future that will transform communities in Ghana and rural India.